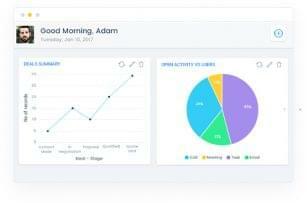 Salesmate is an integration-based, feature-heavy Sales CRM software provider focusing on customization and automation tools to make it easier for business owners of all types to monitor sales, track and store data, precisely target customers at an individual level, and generate new sales while maintaining existing relationships. Businesses of all shapes and sizes, whether they are new or experienced professionals, will benefit from Salesmate. Salesmate offers a free 15-day trial. Salesmate does not offer a free version. Each plan provides the same features. See them here. Pipeline Management: The sales pipeline is customizable to fit your unique sales process. You can create unlimited sales pipelines to suit all your company’s needs. Focus on the right deals at the right time to hit your quota. Quickly spot and remove sales roadblocks. Add new deals in a snap or just automate it. Everything you need is just a click away and laid out in a visually appealing and easy-to-follow manner. Tracking Activities: Use Salesmate’s activities to plan ahead, track your team’s activities, and automate your sales process steps. Plan and track your meetings, calls, demos, lunches, and emails for every deal, contact, and company. Get a personalized sales to-do list that conveniently syncs with your calendar and mobile devices. 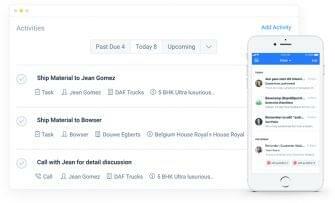 Delegate work to team members by easily assigning activities. Sales Timeline: The pipeline board reveals the deals that have activities overdue or have no activities scheduled at all. Salesmate will help you make sure that your team does not let a perfectly good deal die due to inaction. Sales Goals Tracking: Start tracking sales goals to spark a healthy competition and motivate everyone on your team to go above and beyond. The personalized sales rep dashboard will help your team members see their periodic sales goals, what they have achieved so far and how far they are from reaching the goal. Email Tracking: Know when you have prospects’ attention through email tracking and send a perfect follow up in seconds to get more emails opened, meetings scheduled and deals won. With sales email tracking, you can spend more time prioritizing better, more engaged contacts. Smart Emails: Automate your sales playbook and save hours drafting engaging emails using well-crafted email template libraries, automatically track and organize all email conversations for each deal and customers. Deal Management: Add discipline in your deal cycle by systematically controlling it with Salesmate’s deal management system. 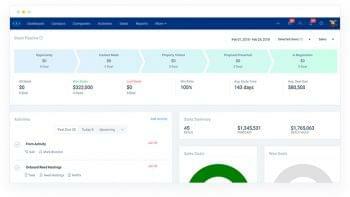 Your business can get precise, real-time visibility of deal cycle with Salesmate deal management CRM to plan new strategies and proliferate profit margin. Sales Automation: Free yourself up from doing the busywork of creating and assigning tasks. Use workflow to update records, assign & rotate deals, score leads, notify internal users, and send emails automatically. Data Entry Automation: Spend more time sending emails, making calls and taking actions, and not logging them manually. Everything you do in Salesmate is effortlessly and automatically tracked to respective deals and contacts. Contact Management Software: Stay conversant with every detail of your contacts to interact effortlessly with your prospects at any time from any point. Now prioritize communications, nurture relations, and optimize sales results by systematizing and structuring all your contact data at one organized place. Visual Sales Pipeline: Focus on the hot and high-value deals and meet your sales quota. This is where Salesmate’s sales pipeline view is beneficial. 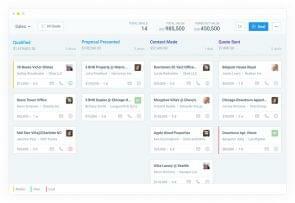 Always see an up-to-the-minute picture of your sales pipeline with Salesmate CRM. Sales Intelligence: Improve sales by using interactive, pre-built, and customizable sales reports. Eliminate guesswork and make smart decisions with data. Identify roadblocks and remove them. Speed up coaching and performance measurement. Sales Forecasting: Sales forecasting software enables your company to take required actions at the right time by giving a clear view of your sales funnel. It automatically unveils the predictive insights from your data and provides statistical analysis to help the management apply their judgment and take necessary steps to use the resources appropriately. Leaderboards: Know how active your entire sales team is, who on your team is putting in the most effort, which activities are consuming the most work, and how they are affecting your team’s efficiency. Custom Reports: On top of the pre-defined reports, your business can create an unlimited number of custom reports. Customize all your data to create views and reports the way you like it. Mobile Apps: Stay in touch with your team, track your team’s performance, get status updates and keep selling when you are on the move. The iOS and Android mobile sales apps gives you everything you need to keep selling no matter where you go. Flexible to Fit: Businesses can design and mold each Salesmate module to your sales process in a few simple steps. Reduced learning curve, easy adoption, and massive productivity boost are just the starting point. Secure & Reliable: When you use Salesmate, you own all data created, computed, and derived for you. All confidential data is stored and transmitted with enterprise-grade security and encryption technologies. Email Templates: Use Salesmate’s well-crafted emails for each stage of the pipeline or build your own library for your entire team to use with just one click. When you use email templates to send automated emails, you can personalize emails to thousands of customers with ease. Salesmate’s Support Center on their website breaks down each feature into easy-to-read articles with in-depth explanations and useful screenshots to help your business with any issues that may arise. There is no phone number listed on their website, but you can submit a request for help. You can find a link to their support center here. Salesmate is a Sales CRM provider with a significant list of features and integrations that will make running your business and generating sales much easier. The solution is an affordable option for businesses of all types, sizes, and levels of experience. Salesmate makes a point of breaking down each feature with page-length descriptions, which goes above and beyond what other companies provide on their websites. Salesmate’s features are broken down into four distinct categories on their Features page: Accelerate Sales, Smart Productivity, Gain Visibility, and Have It Your Way. Each category has five features in it, which will help your business grow. Some of the significant features that help the solution stand out are sales and data entry automation, their integrations, and pipeline management. The automation features take lots of the hard work out of business owners’ hands allowing them to focus more on generating sales and establishing new contacts while maintaining relationships with their current customers. Salesmate also has a large list of integrations that really improve the user experience, especially if you’re already an established business owner with valuable information in tools like Google Drive and Calendar. The use of pipelines to make their CRM service more visually appealing is a unique way to make Sales CRM software more approachable for new business owners. Salesmate’s pricing plans also stand out in a number of ways — starting with their competitive pricing. The solution is generally affordable, with plans at $12 per user, per month, or $15 per user, per month depending on if you choose to pay monthly or annually. If you’re a small business owner, this might be a great option to consider, especially since each tier comes with the same exact features. Some providers, depending on their options, will limit the amount of features given to their customers. Salesmate seems to be one of the few that does not do this. However, if you’re a new business or you only need certain features, you will be paying for more than you need. The limited pricing options, regardless of their low price, could be discouraging for some business owners who aren’t so tech-savy or reliant on Sales CRM software. But with that comes a unique support center on their website that breaks down how to use each feature to its fullest potential with extensive descriptions, screenshotted images, an FAQ page, and a blog. There is no number to call on their website, so business owners will have to submit a request for help instead. Overall, Salesmate is interested in making it as clear as possible what their potential customers will be getting themselves into. Their features list is extensive, outlining how to use each one specifically and why it matters to your business. Their integrations are useful for businesses who are already established. If you’re looking for Sales CRM software with a low price, a large features list, tons of integrations, and customizable dashboards, email templates, and reports, try the 15-day free trial Salesmate offers and see if they’re right for your business. What Do You Think of Salesmate?